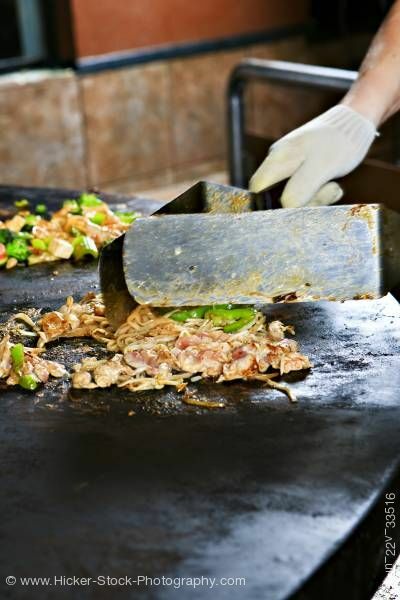 Stock photo of food being prepared at the Mongolie Grill World Famous Stirfry Restaurant in Whistler Village, British Columbia, Canada. Stock Photos from the collection "Whistler Stock Photos"
Food preparation at the Mongolie Grill World Famous Stirfry Restaurant in Whistler Village, British Columbia, Canada. Property Released. This restaurant is unique in that you select from a variety of vegetables, meats, seafood, and Asian Pacific noodles and they create your stirfry meal fresh on the grill. Grab a bowl, pick your favorite items from the buffet and marvel as the energetic chefs prepare it for you. The friendly owners and waitstaff go the extra mile to make sure that the dining experience is pleasurable and also fun. Save room for the house specialties – Mongolie Wraps with special sauces. Related pictures with keyword "Whistler Stock Photos"